Oseltamivir is an important antiviral drug used in the treatment of influenza. It is currently produced commercially in a semisynthesis starting from shikimic acid which is sourced from the Chinese star anise. Problem is that in the event of a influenza pandemic there might not be enough of this particular plant and that is why chemists are trying to find alternative ways to synthesise oseltamivir. The Barry Trost lab recently published oseltamivir total synthesis number 6 ( DOI). The molecule in question has a 6-carbon cyclohexane frame with one carboxylic acid group, a hydroxyl group and two amino groups (the actual drug called Tamiflu is a phosphate salt). The starting material, bicyclic lactone 1 already has several components in place but is achiral while the target molecule has 3 stereocenters. Step one therefore introduces the first of the two amino groups in an AAA reaction (Trost's own invention of 30 years ago) with allylpalladium chloride dimer, the DACH ligand and trimethylsilyl protected Phthalimide as the nucleophile. The lactone ring is opened and carbocylic acid group esterified in one go. Thioester 4 is formed by application of a strong base (KHMDS) and PhSSO2Ph. Grieco elimination to diene 5 is then induced by mCPBA. 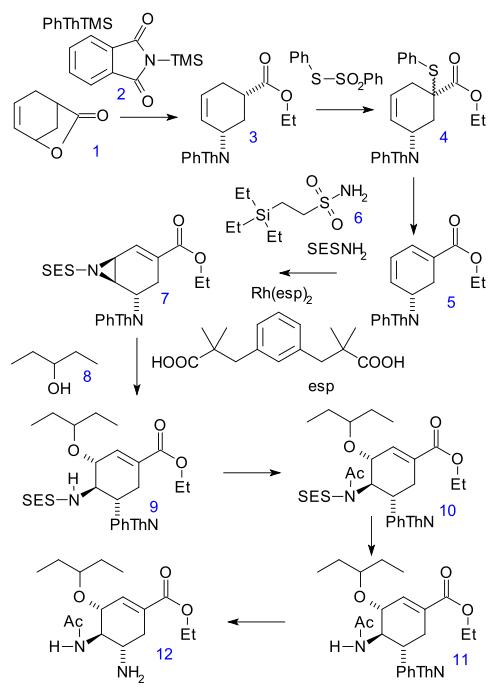 This compound is almost identical to the diene in Corey's version which his lab synthesised in about 7 steps from butadiene and acrylic acid. Trost claims his version is the shortest yet from a commercially available compound but Coreys starting materials are more easily recognized as simple raw materials you could buy everywhere. Much research effort was spent on the aziridation step. SESNH2 (2-(trimethylsilyl)ethanesulfonylamine)) is a nitrene precursor with a protective group rolled in one. Added reagents are a catalyst based on rhodium with two esp ligands, base magnesium oxide and an oxidizing reagent (Iodobenzene diacetate). The final steps are ring-opening of the aziridine with 3-pentanol and boron trifluoride, Acylation of the amino group and its deprotection with TBAF and finally removal of the phthalimide group with hydrazine.